If you own a cat–or one owns you–you’ve almost certainly heard the hacking sounds and cleaned up the unpleasantness that accompany coughing up a hairball. While hairballs are a common malady among felines, they can occasionally be serious. Here are a few things you should know about hairballs in cats. Cats groom themselves with their rough tongues, in part to rid their coats of loose hairs, some of which get swallowed. Usually it just passes though their digestive tract, but hair may collect in their stomachs or intestines. Your cat then vomits up that mass of matted hair, known scientifically as a “trichobezoar,” to clear it from their system. Hairballs are often tubular in shape, as the mass is compressed while passing through your cat’s esophagus. Cats who shed a lot, groom often, or have long hair are at a heightened risk of developing hairballs. Even if your feline never developed them as a kitten, as cats grow up, they become more prone as they groom more carefully and often. Any condition that leads to excessive grooming, such as skin conditions, allergies, or flea infestations, can also lead to an increase in hairballs. As noted earlier, you’ll occasionally hear your furry friend hacking or gagging, or even witness them vomiting up the offending hairball. Sometimes, you may find that your kitty has only thrown up food or mucus, but an unproduced hairball might be at the root of the problem. If you notice these symptoms, you can try a hairball remedy. Lubricants and jellies, commonly available at pet supply stores, will help them pass the hairball or cough it up. Directions for the products differ, so read the labels carefully and talk to your vet about which products might be right for your cat. 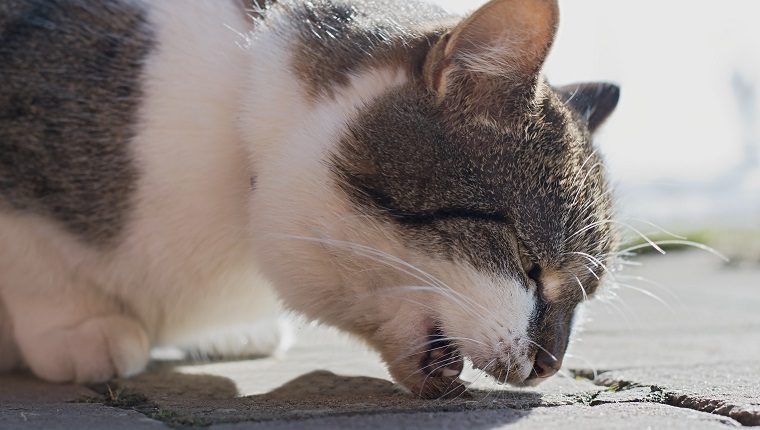 A periodic hairball isn’t a big deal, but if it’s happening a few times a week, it might require more aggressive prevention tactics to get them under control. 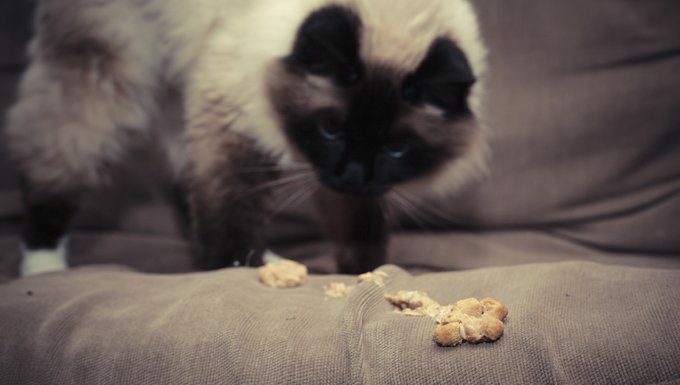 Hairballs can become lodged in a cat’s esophagus or intestinal tract, which can even be fatal. Serious hacking for more than a day can be a sign that it’s developing into a major complication. Be on the lookout for reduced appetite, lethargy, and constipation or diarrhea. If you notice these symptoms, see a veterinarian immediately. Though rare, some severe cases may require surgery. If your cat is developing hairballs due to excessive grooming, your vet will be able to give you advice for treating any underlying conditions. Since your cat isn’t likely to stop grooming or shedding, you probably won’t be able to prevent hairballs entirely. However, you can take measures to lessen their frequency or their severity. Brush your cat frequently. Less loose hair to swallow means fewer hairballs. Your cat might even grow to find this is good bonding time with you. Occasional trips to the groomer, especially for long-haired cats, may be another option. Change your cat’s diet. Some varieties of cat food contain ingredients that focus on improving skin and coat health to help reduce shedding and often add fiber to stimulate cleansing of the bowels. Give your cat plenty of water. More water won’t cure hairballs, but it’s essential to keeping your cat’s digestive tract running in top shape, so make sure they’re getting enough. A running cat water fountain may help entice them to drink more, as can refilling their dish frequently with fresh water throughout the day. Get your cat a toy. New toys can help distract them from excessive grooming—and get them more stimulation and exercise. Exercise aids general health, which may help your cat’s system work a little smoother, too. Does your cat ever get hairballs? What do you do to help your kitty? Let us know in the comments below!